Al-Faisal College Auburn was established in 1998. Al-Faisal College Campbelltown opened in 2013 while Al-Faisal College Liverpool opened in 2014. Al-Faisal College contributes to a number of events every year. 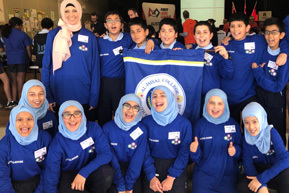 Al-Faisal College is an independent co-educational school where opportunities for learning are equally valued for boys and girls from Kindergarten to Year 12 (K-12). The College was established in 1998 and although our school is fairly young, it has grown remarkably from its humble beginnings. We have worked hard to provide our students with the best and latest technology, interesting teaching and learning programs and pastoral care. Our main goal is to work towards our students becoming responsible, productive and contributing members of the Australian society. all times. Our highly qualified and dedicated teachers and staff are our greatest assets. We work together with the parents as a team to provide the best possible environment in which our students will work to their full potential. Al-Faisal College strives for academic excellence and every student is encouraged to achieve his/her best. We are very proud of the results of our Year 12 students who undertook the HSC examinations last year. Al-Faisal College was ranked 26th in the State in the HSC. I applaud and acknowledge the hard work and effort of all staff members and executives who contributed to our students’ success. Our students have decided to continue to further their studies at tertiary level, gaining entry into the best universities in NSW. Congratulations to our graduating class! Within this website you will learn that Al-Faisal College offers education to students from Kindergarten age to Year 12. 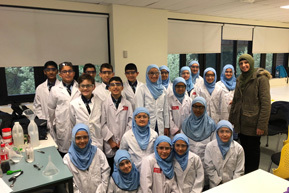 You will discover that we are one of the largest Schools in Australia with unique links to the Islamic sector. At Al-Faisal College you will find a school with warmth, values and an integrity which has caused it to become one of Australia's most respected schools. I hope that the new generations to come, will be better equipped with knowledge, skills and wisdom in order to contribute to the prosperity of Australia. Al-Faisal College (Auburn) was established on 27 April 1998 on the present site. In the first year, enrolments were 49 students spread amongst 3 classes, from Kindergarten to Year Two. Al-Faisal College Campbelltown opened in 2013. It was formerly Iqra Grammar College) and it was established in 2006 to provide a balanced education to children from Kindergarten to Year 12. Al-Faisal College liverpool was etablished in 2015. Currently our enrolment is from Kindergarten to year 9. Al-Faisal College ranked 26th in the State! Congratulations to our Year 12 students on your outstanding achievement!!! This year there were 190 distinguished achievers and as a result each student was presented with a cheque of $500 for every subject where they scored an ATAR of 90 or above. Congratulations to Irna Khan for topping General Mathematics achieving 100% for this subject in the HSC!!! Irna was presented with a certificate from the Former NSW Education Minister The Hon. Rob Stokes MP. 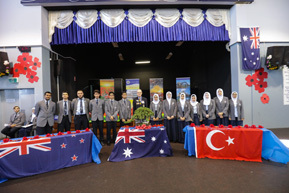 On Monday 8th April 2019, Al-Faisal College, Auburn, held an ANZAC Day Commemorative Assembly. Mrs. S. Khan Hassanein, Deputy Principal of Al-Faisal College welcomed the distinguished guests, politicians and dignitaries on behalf of Mr Shafiq Khan the co-founder and Managing Director of Al-Faisal Colleges, Mrs Ghazwa Adra Khan, the co-founder and Executive Principal and the Director of Education Dr Intaj Ali. Mrs A. Qasim reminded the students of the selfless acts of the AIF on the shores of Gallipoli. 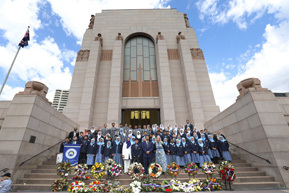 On Tuesday 9th April 2019, Al-Faisal College attended the RSL and Schools Remember ANZAC Commemoration Service held at the Hyde Park War Memorial. 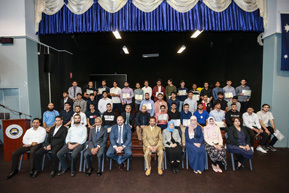 Captains, Vice-Captains and Prefects both primary and high school represented Al-Faisal Colleges (Auburn, Campbelltown, Liverpool) at the Service. Every year, since 2014, Al-Faisal College has been participating in the Respect, Understanding and Acceptance (RUA) workshop held by the NSW Jewish Board of Deputies. This is a great opportunity for our students to meed year 9 students from other schools with different faith, culture and religion. The students get along with comfort and ease, they all participate in a number of group and pair activities. 14 students from the AFC Logics Lego Robotics Team won the Innovation cup for best Robot design at the First Lego League (FLL) Challenge at Baulkham Hills PS. On Wednesday the 19th of September 2018, Al-Faisal College held a graduation ceremony for the Year 12 graduates, Class of 2018. The occasion was marked by the presence of many official guests, diplomats, Consul Generals, Mayors, Deputy Mayors, Councilors from Cumberland, Canterbury-Bankstown, Campbelltown and Liverpool Councils, members of the Association of Independent Schools NSW, State President and Vice President of the Country Women’s Association (CWA). Kindergarten Graduation Day marks the conclusion of the first year of schooling for our Kindergarten students before they progress onto Stage 1, Year 1. Students celebrate their Graduation Ceremony by wearing a beautiful Royal Blue Graduation Gown and hats. They also move the tassel of their hats to the side once they have officially graduated. Over 100 students from Years 3-6 will have an opportunity to spend the day at Macquarie University as part of STEM week to investigate different aspects and elements of gears/planes/chemistry. Over the past two terms all the Al-Faisal campuses have organised fund raising drives such as pizza days, Abaya days and the most recent and unique "Come dressed as a farmer day". Teachers, students and the School Board have given generously raising a total of $15000 which was presented to the State President and Vice President of the Country Women’s Association (CWA) during the Assembly. Ms Annette Turner, State President of the CWA, addressed the assembly and said that the donation will go to the CWA, Disaster Relief Fund which gives 100% of all monies directly to family farmers affected by the drought. The CWA is in touch with families who are struggling and they assist by paying for basic necessities such as groceries, electricity bills and children's needs. 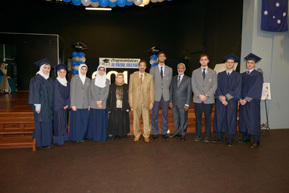 During the Year 12 Graduation Day, The School Captains presented Mr Shafiq Khan co-founder and Managing Director and Mrs Ghazwa Adra Khan co-founder and Executive Principal of Al-Faisal College with plaques in recognition of their 20 year establishment, commitment and service to the community. Dr Intaj Ali, Director of Education was also presented with a plaque for his outstanding commitment to education and raising the school bar. Al-Faisal College, Auburn, hosted the delegates from the Pontifical Council for Interreligious Dialogue, from the Vatican. The delegates included His Excellency Bishop Miguel Ángel Ayuso Guixot MCCJ, Monsgnor Indunil Kodithuwakku, Monsgnor Santiago Michael as well as Father Markus Solo SVD. Accompanying the delegation were His Excellency Archbishop Christopher Prowse, Ms. Louise Zavone, Sr. Giovanni Farquer and Members of the Archdiocesan Commission for Interfaith an Ecumenical Relations. 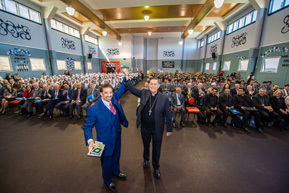 The aim of the visit was for the delegates to gain a first-hand understanding of the Muslim Community within Sydney, and further strengthen relations between the Archdiocese and the College. Copyright Al-Faisal College. All Rights Reserved 2019.